The U.S. Bureau of Economic Analysis released the latest state income estimates this week, including revisions to 2014 data. Similar to our state’s overall economy and labor market, the data show strong growth that outpaces the nation. Again, the economy is on the upswing, during which time Oregon typically grows significantly faster than the average state. So it’s no surprise to see Oregon’s personal income gains over the past year ranked second best among the 50 states. Wages grew 2nd fastest as well over the year. Relative to our office’s forecast, the results are somewhat of a mixed bag. Wages were a bit above forecast, non-wage income a bit below, however in aggregate, personal income in 2015q1 was 0.15% below forecast. By far the largest error component here were transfer payments which came in nearly 1 percent below forecast. The largest shift in transfer payment patterns was in Medicaid, which grew strongly in 2014 following the rollout of the ACA (aka Obamacare) and tapered off in 2015, at least in terms of growth rates. All else effectively cancels each other out and the end result is not much different from our outlook. As detailed last month, Oregon’s relative income measures continue to improve along with the economy. The graph below is updated to include actual 2015q1 income data and not just our office’s estimates. 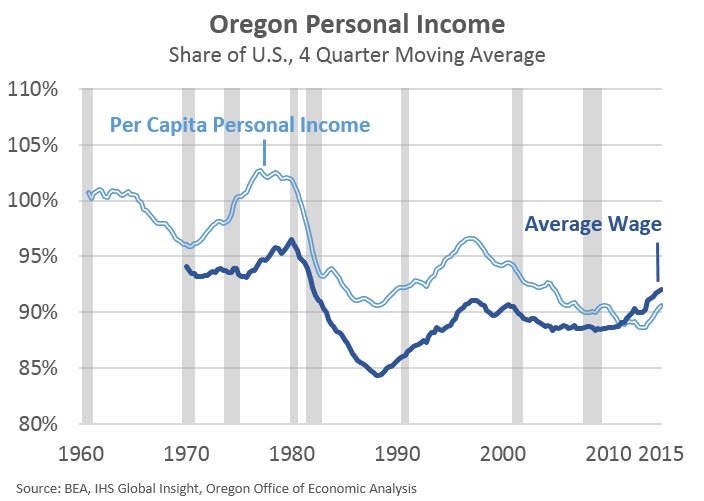 Oregon’s per capita income is back to pre-Great Recession levels relative to the nation (about 90-91%.) Oregon’s average wage shows even larger gains in recent years. Of course both remain below the national average.